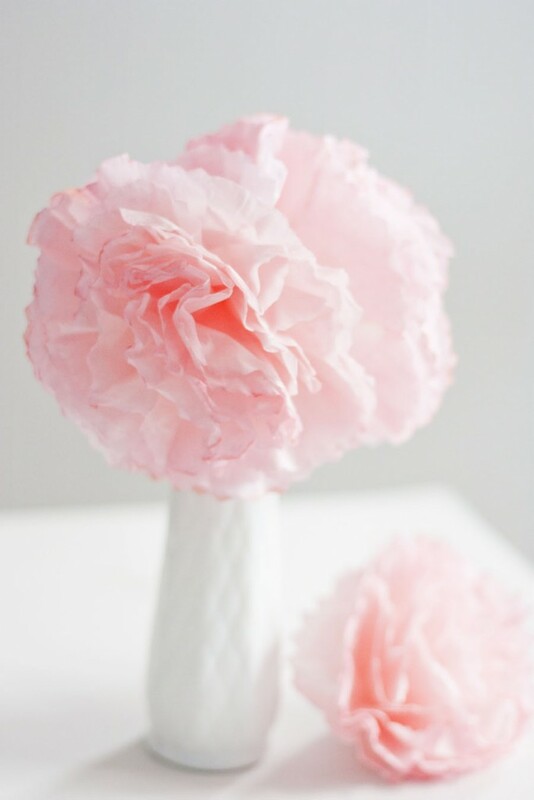 In the spirit of Valentine’s Day next week, I’m sharing these pretty paper peonies with you today! Although mine are pink, you can easily dye these any color you wish to match your decor or the time of year. 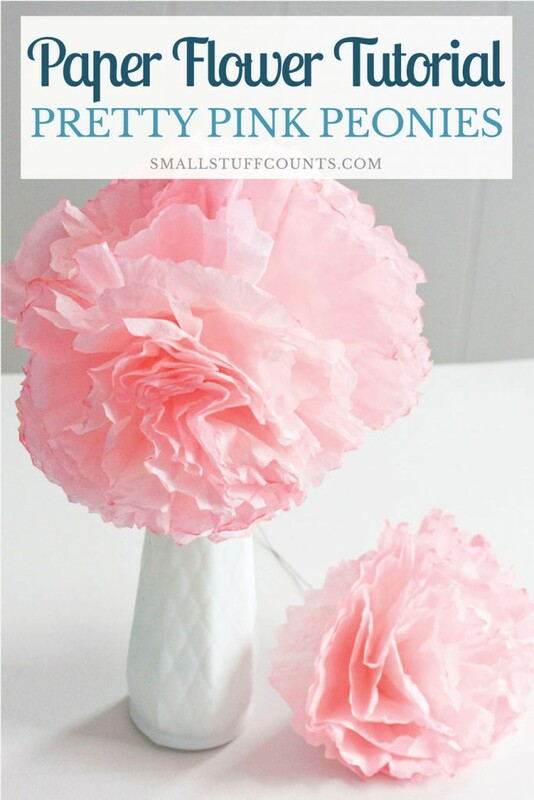 The tutorial for these paper flowers is fairly simple and results in gorgeous peonies that can be used as home decor, bridal/baby shower centerpieces, Valentine’s Day or Mother’s Day gifts, or just a fun craft project with your friends or kids. I led a “crafternoon” workshop in my town last year, and all of the participants enjoyed making these paper flowers. 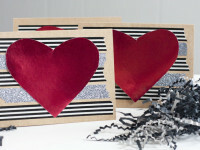 They are simple enough for the beginner crafter and they are also extremely frugal to make. This video will show you the entire process start to finish! Keep scrolling down for the step-by-step photo tutorial. Stack four coffee filters and fold in half three times. 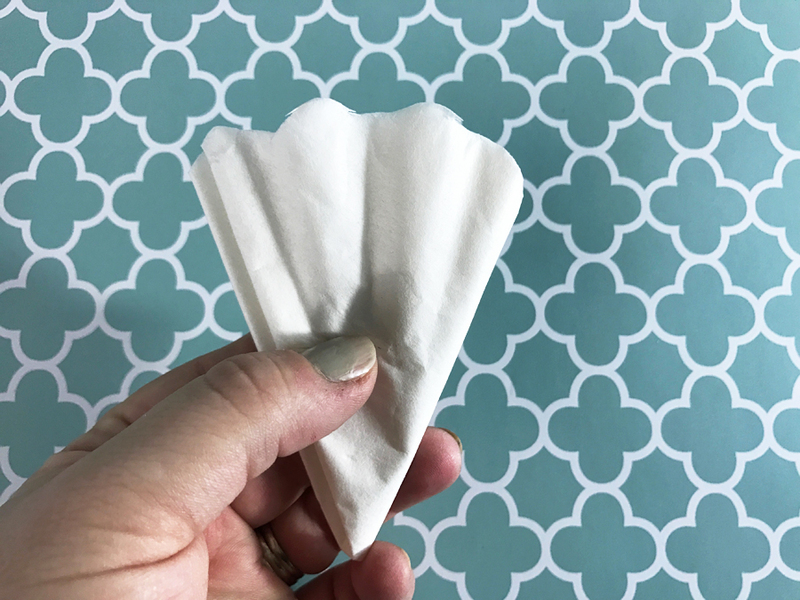 Your coffee filters should now be folded into eighths. Using a scissors, cut wavy scallops along the curved edge. You don’t need to be precise, you’re just adding dimension! This adds shape to the tips of your petals. 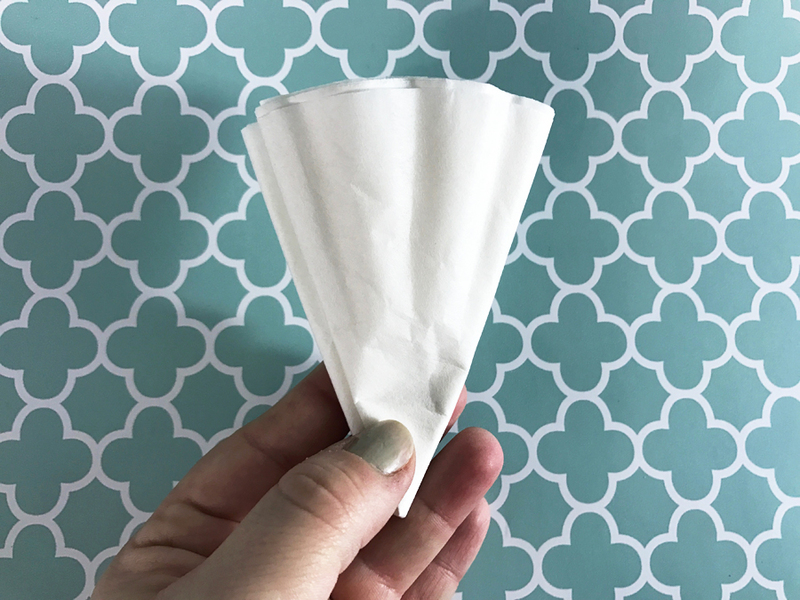 Once you are done cutting, unfold your filters but keep them stacked together. Cut your wire to the desired length of your flower stems. I made mine about 6 inches long, but it’s really up to you. Use a pencil or pen to shape a loop at one end of the wire. 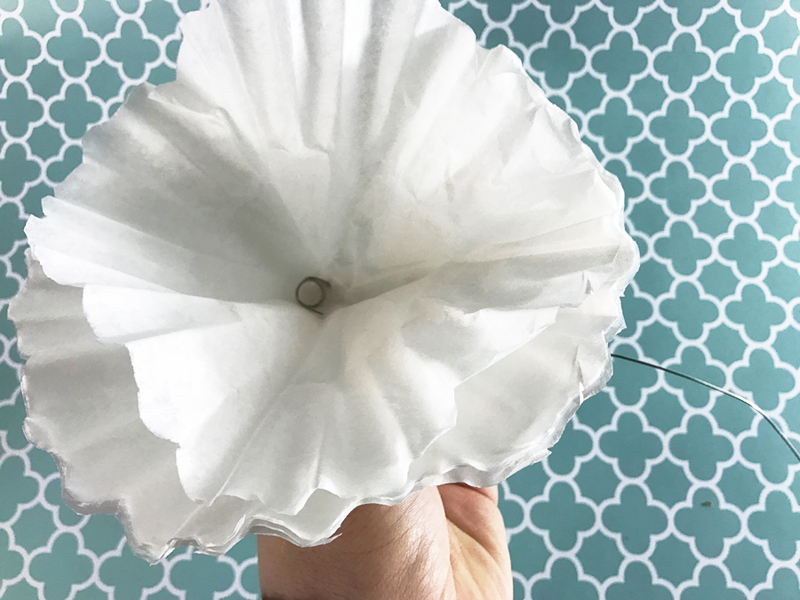 Then poke the other end of your wire through the center of the filters, adding a drop of hot glue along the wire in between each filter so the filters stay in place and don’t just slide back down the wire. Add a few drops of food coloring to a shallow dish of water. You can choose any color you like! The number of drops of coloring you add will determine how saturated your flowers are. Bunch the filters together with your fingers and dip in the water. Have fun experimenting with this step! I dyed my flowers pink, let them dry and then held only the tips in the same colored water for a few minutes so the tips would be a darker pink. Try varying the length of time you hold them in the water to achieve different shades of color. 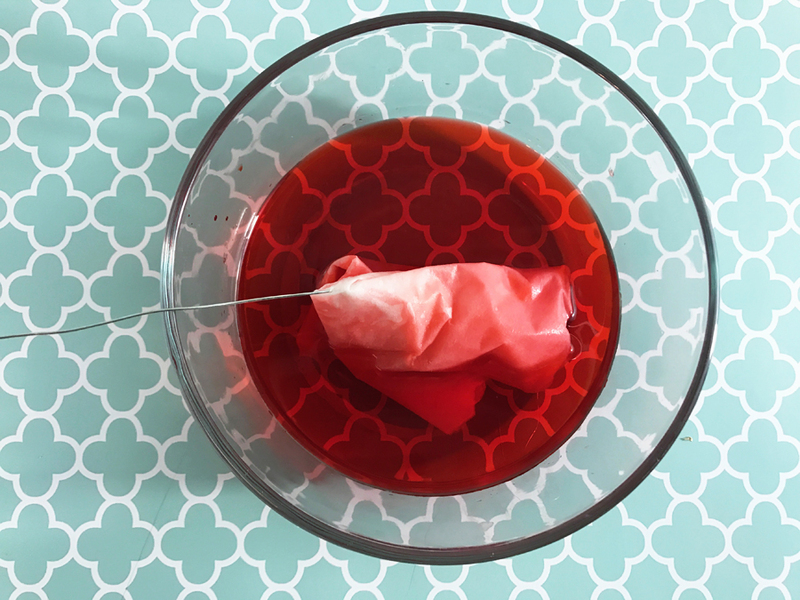 You could also experiment with using multiple colors to create a tie-dye effect. Just let the flowers dry fully in between layers of dye, or else the colors will bleed together. Spread a layer of newspaper on your table and lay your flowers on it to air dry. 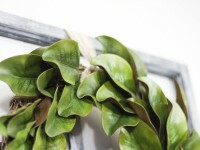 In my experience, the flowers will take a few hours to dry completely. You can point a fan on them if you want to speed this up. Once your flowers are dry, it’s time to fluff! This is more of an art than a science. Pull the layers of filters apart and fluff them up. Pinch, tug and fluff until it’s shaped like a flower. Aren’t they gorgeous? I love the pastel pink on these. 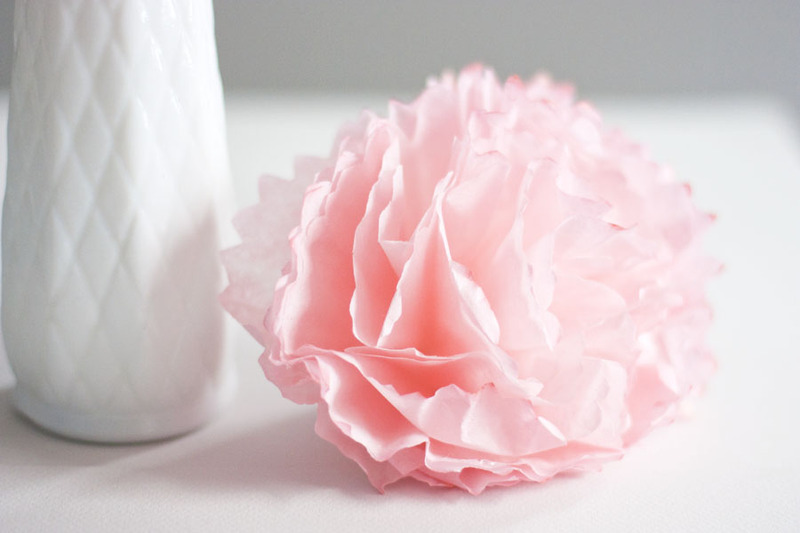 Perfectly feminine paper flowers great for any occasion. And they’re way more affordable then a bouquet of real flowers! 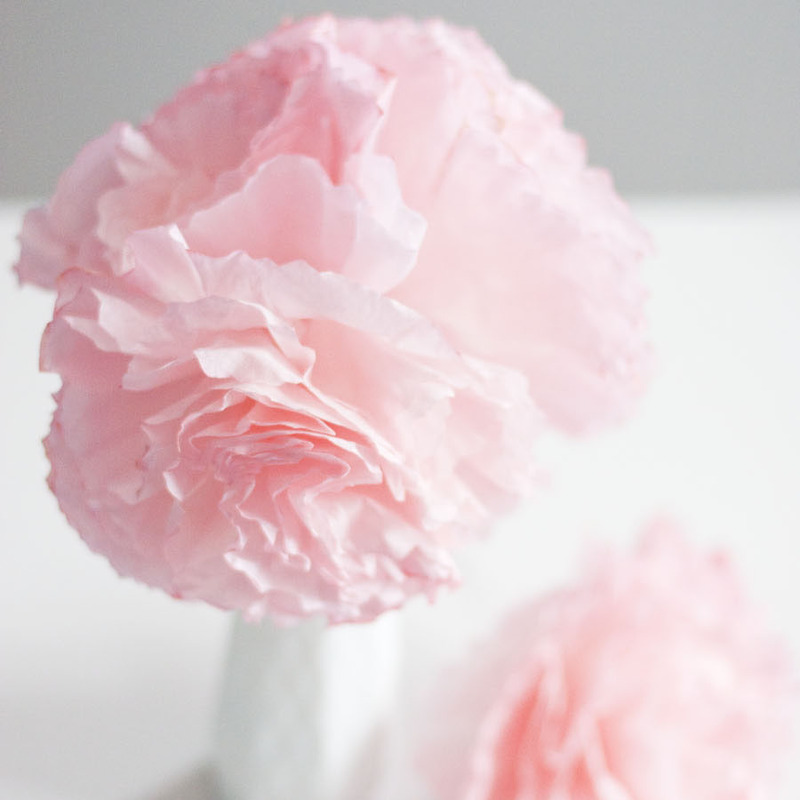 I tucked groups of three paper flowers into skinny thrift store vases and they are beautiful! What color are you going to make? I love when my spring peonies bloom! Now I can have them other times of the year! 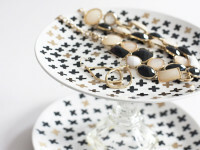 I cant wait to try this idea! Wow you’re so creative! These are gorgeous!!! These are so pretty and I have always wanted to try them. 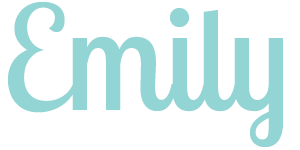 Your tutorial is perfect and they seem pretty easy to do! Thanks.